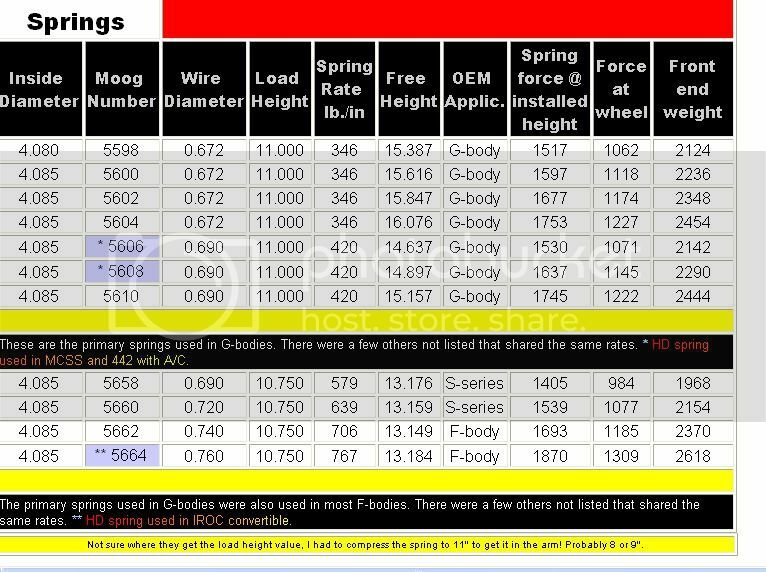 Does anyone know the actual spring rates for the factory front springs? I have two sets available to me now, and I'm willing to make a parts run to the local yard(s) if I have to. I really want the softest front springs I can find for Richard as I'm putting him back together. I have his original springs (1997 S10 LS 4.3L V6, auto, standard cab, short bed, not sure the rate), and I have a pair of springs from a 1994 S10 base, 2.5L 4 banger, manual 5 speed, standard cab, short bed as well. It's pouring rain right now and I'm not going to go measure what I have now with the calipers. I was wondering if anyone knows for sure. That chart graphic was exactly what I was looking for. I also did a little research in the RockAuto catalog. It seems the 5658 to 5664 range of numbers were all used or deemed appropriate replacements (by RockAuto) for 1st generation S10 pickups in various configurations. The 2nd gen ones were a different number series, and had a "load height" of 12 inches.